I visited Ireland a few years ago and I remember a bread baker telling me this as we toured his shop. 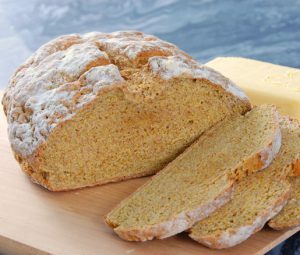 You can find a thousand recipes for Traditional Irish Soda Bread – the American ones really like to add raisins – but if it varies from these 4 basic ingredients, it’s not the real thing. And you wouldn’t want the fae gettin’ all up in your business about that, now would ye? 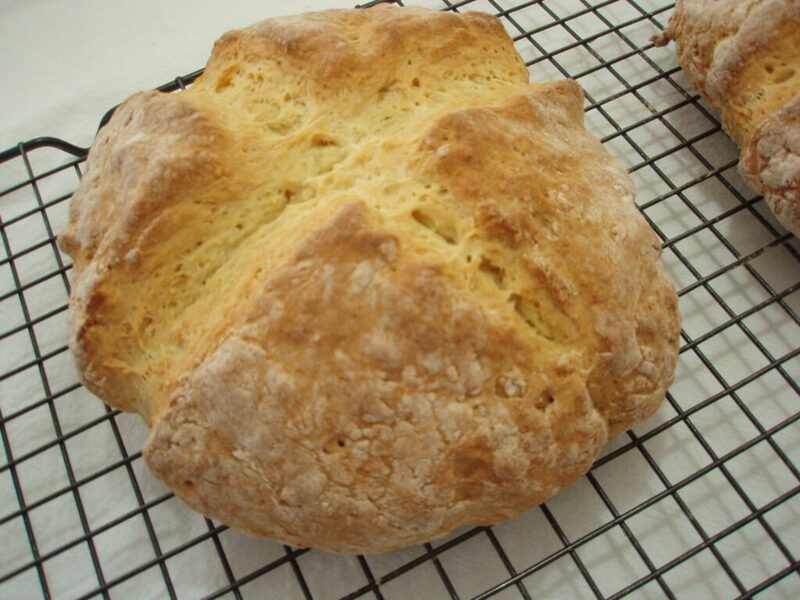 Soda bread is the perfect accompaniment to my Irish Stew recipe. Try this recipe and see if you don’t notice a big difference! I visited Ireland a few years ago and I remember a pub owner telling me this when I asked for the recipe for his delicious soda bread. 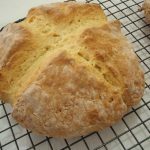 You can find a thousand recipes for Authentic Irish Soda Bread, but if it varies from these 4 basic ingredients, it’s not the real thing. And you wouldn’t want the fae gettin’ all up in your business about that, now would ye? 4 cups Flour I recommend pastry flour rather than all-purpose. Traditional Irish wheat is soft, and pastry flour will mimic this better. 1 to 1 3/4 cups Buttermilk or sour milk. The liquid required will be determined by the flour choice. If you use whole wheat you’ll need more liquid than the 1 cup. Heat oven to 425 degrees F. Cover a baking sheet with parchment paper or a Silpat sheet, or brush the sheet with melted butter or spray with non-stick spray. Combine dry ingredients in a large bowl. Gradually stir in 1 cup buttermilk, mixing gently with your fingers until dough is firm enough to be gathered into a ball. If dough crumbles, add more liquid 1 tbsp at a time, just until it holds together. Avoid kneading the bread! The less you handle it, the better! Place on a lightly floured board and pat into an 8-inch flattened round loaf. It will look a bit rough. It’s supposed to. Place the loaf on baking sheet and slash a 1/2-inch deep “X” into the top of the dough with a sharp knife. Serve warm with Irish Stew or Corned Beef and Cabbage. Sláinte! For a good video that shows how you form and mark the loaf, click here. If you need a Silpat sheet, find one here. I use these ALL THE TIME and they will make your baking so much easier. Wow, once upon a time I ate Irish bread and it was the best bread that I had ever eaten in my entire life (and I am no big fan of bread in general). I had been looking for this recipe since then. That bread looks absolutely beautiful Don, and the good part is I love bread a lot I’ve tried so many I can’t count. Am definitely going to use that recipe to bake something and if I can’t I have a close friend who would absolutely love to do it just to test her baking skills. So thanks for this article inauthentic Irish soda bread.